Mucopolysaccharidosis type II (MPS II) is a rare, life-limiting, X-linked recessive disease characterised by deficiency of the lysosomal enzyme iduronate-2-sulfatase. Consequent accumulation of glycosaminoglycans leads to pathological changes in multiple body systems. Age at onset, signs and symptoms, and disease progression are heterogeneous, and patients may present with many different manifestations to a wide range of specialists. Expertise in diagnosing and managing MPS II varies widely between countries, and substantial delays between disease onset and diagnosis can occur. In recent years, disease-specific treatments such as enzyme replacement therapy and stem cell transplantation have helped to address the underlying enzyme deficiency in patients with MPS II. However, the multisystem nature of this disorder and the irreversibility of some manifestations mean that most patients require substantial medical support from many different specialists, even if they are receiving treatment. This article presents an overview of how to recognise, diagnose, and care for patients with MPS II. Particular focus is given to the multidisciplinary nature of patient management, which requires input from paediatricians, specialist nurses, otorhinolaryngologists, orthopaedic surgeons, ophthalmologists, cardiologists, pneumologists, anaesthesiologists, neurologists, physiotherapists, occupational therapists, speech therapists, psychologists, social workers, homecare companies and patient societies. Expertise in recognising and treating patients with MPS II varies widely between countries. This article presents pan-European recommendations for the diagnosis and management of this life-limiting disease. Mucopolysaccharidosis type II (MPS II, Hunter syndrome, Online Mendelian Inheritance in Man number 309900) is an X-linked, recessive disease that is characterised by deficiency in the activity of the lysosomal enzyme iduronate-2-sulfatase (I2S), owing to a mutation in the I2S gene (IDS) [1, 2]. Like other mucopolysaccharidoses, the enzyme deficiency in MPS II results in the lysosomal accumulation of glycosaminoglycans (GAGs). The condition is multisystem in nature, with patients exhibiting coarsening of facial features, bone and joint abnormalities, short stature, and changes in the heart, respiratory system, hearing, and vision . Severely affected patients have profound neurological involvement, with progressive learning difficulties and behavioural abnormalities, as well as disturbed motor function . MPS II is one of the most common mucopolysaccharidoses, with an estimated prevalence of 1 in 140 000-156 000 live births in Europe [4–6]. The disease affects males almost exclusively, although a few symptomatic females have been identified [7–10]. Age at onset and disease progression are heterogeneous: patients typically have a normal appearance at birth, with the initial signs and symptoms emerging between the ages of 18 months and 4 years, depending on disease severity [2, 11, 12]. Because the initial signs and symptoms of MPS II can be non-specific, identification of patients at a young age can be problematic, resulting in a substantial delay between disease onset and diagnosis. Life expectancy varies according to disease severity; patients with severe phenotypes are expected to live for less than 2 decades, whereas individuals with attenuated forms of MPS II may survive into their 50s or 60s [2, 3, 13]. Until recently, the management of patients with MPS II has been largely supportive, focussing on the treatment of signs and symptoms rather than addressing the underlying lysosomal enzyme deficiency. Disease-specific therapy for MPS II is now available throughout Europe, although expertise in diagnosis and managing MPS II varies widely between countries. Thus, there is a need for guidance on how to recognise, diagnose and manage patients with this condition, with particular focus given to the multidisciplinary approach needed for this multisystem disease. This article describes the recommendations developed by the Hunter Syndrome European Expert Council (HSEEC) for the diagnosis and management of MPS II. The HSEEC is a group of European clinicians with substantial experience of diagnosing and treating patients with MPS disorders and lysosomal storage diseases (LSDs). Others with expertise in particular aspects of the management of MPS II have also contributed to these recommendations - including specialist clinicians, a specialist nurse and a representative of a patient society - with the aim of providing practical guidance on all aspects of patient care. A full list of contributors can be found at the front of this article. These recommendations have been developed using an evidence-based approach. Owing to the rarity of MPS II, there is a paucity of published data on the management of this disease, so data from clinical trials, observational studies, review articles and case studies were all considered when formulating recommendations. For those topics for which few or no published data were available, the information presented is based on the clinical experience of the authors. Such instances are clearly indicated in the manuscript as Consensus Opinion (CO). Literature searches for topics relating to the management of patients with MPS II were carried out in PubMed and EMBASE between 13 July and 16 September 2010, using Medical Subject Heading Terms and relevant keywords. To ensure relevance to the modern day clinical setting, literature searches were limited to articles published since 1 January 1990. Older articles identified by the authors were also included. Only articles from the peer-reviewed literature were included in the literature search. Articles in a non-English language with an abstract, and articles in the English language without an abstract were included if they were considered relevant to the search being carried out. Abstracts from industry-sponsored meetings were not included. MPS II is a progressive disorder that has traditionally been categorised into a severe form and a mild/attenuated form based on the age at onset of signs and symptoms, the presence or absence of neurological involvement, and length of survival . However, this classification appears to be a gross oversimplification, particularly as I2S activity is equally deficient in both forms of the disease . Rather, the disorder should be regarded as a continuum of phenotypes between two extremes . The multisystem nature of MPS II and the heterogeneity of disease progression mean that patients may present with many different signs and symptoms to a wide range of specialists. Characteristic features of MPS II include coarsened facial features, an enlarged head, an enlarged tongue, hypertrophic tonsils and adenoids, irregularly shaped teeth, recurrent otitis media, a distended abdomen due to hepatosplenomegaly, abdominal and/or inguinal hernias, and thickened pebbled skin (Figure 1) [11, 14]. Patients with MPS II also exhibit short stature, although children with severe phenotypes are often initially taller than their peers, before growth slows . Other signs and symptoms can result from changes to the musculoskeletal system, eyes, gastrointestinal tract, airways and cardiovascular and nervous systems. Although the specific combination of signs and symptoms may vary considerably between individuals, the presence of any of the features listed may be suggestive of MPS II. The evolution of signs and symptoms is often a better indicator of a diagnosis of MPS II than a static snapshot of the presence or absence of certain manifestations. Therefore, it is important to monitor changes in signs and symptoms over time (CO). Characteristic features of mucopolysaccharidosis type II. Fourteen-year-old boy showing (a) coarsened facial features (including enlarged head, broad nose with flared nostrils, prominent supraorbital ridges, large jowls, thickened lips, and irregular peg-shaped teeth), (b) musculoskeletal manifestations (including short neck, short stature, and joint stiffness [unable to raise arms above head]) and (c) abdominal distension due to hepatomegaly and splenomegaly. (d) Tracheomalacia seen at airway endoscopy. (a)-(b) reproduced with permission from Martin and colleagues , Copyright © 2008 by the AAP; (a)-(c) courtesy of Professor Joseph Muenzer; (d) courtesy of Dr Iain Bruce. A suspected diagnosis of MPS II should be confirmed by biochemical or genetic analysis. An algorithm for testing for MPS II is shown in Figure 2. Quantitative and qualitative analysis of urinary GAGs is useful as a preliminary screening test to help establish that an individual has a form of MPS; however, this does not confirm a specific diagnosis of MPS II . The 'gold standard' for the diagnosis of MPS II in a male proband is demonstration of deficiency of I2S enzyme activity in leukocytes, fibroblasts, or plasma. Measurement of I2S activity in dry blood spots also represents a valuable method for screening, as no heparin is needed and very little blood is required. Dry blood spots are stable for several days at room temperature so transportation of samples is easy , and this may extend testing to areas some distance from diagnostic centres, which are not widely available. Documentation of normal enzyme activity of at least one other sulfatase is critical, as low levels of I2S activity are also characteristic of multiple sulfatase deficiency . Finally, molecular genetic testing of IDS to confirm the diagnosis may be useful in male patients with an unusual phenotype or in whom the results of I2S testing are inconclusive . Molecular genetic testing of IDS is also important for genetic counselling, especially if there is no known family history of MPS II. Once the disease-causing mutation has been identified, a detailed pedigree analysis should be carried out to identify family members who may be carriers of a disease-causing mutation or at risk of the disease, and genetic counselling should be offered to all family members. 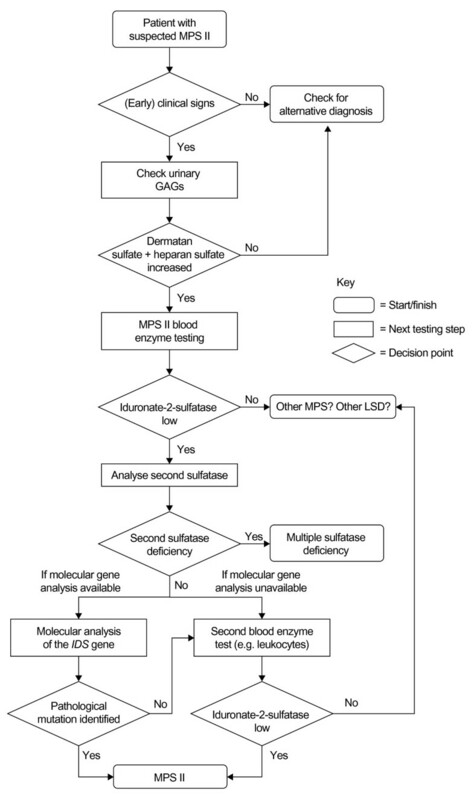 Diagnostic algorithm for mucopolysaccharidosis type II (MPS II). The 'gold standard' for the diagnosis of MPS II in a male proband is demonstration of deficiency of iduronate-2-sulfatase enzyme activity in leukocytes, fibroblasts, or plasma. Measurement of iduronate-2-sulfatase activity in dry blood spots also represents a valuable method for diagnosis, as no heparin is needed and very little blood is required. GAGs = glycosaminoglycans. IDS = iduronate-2-sulfatase gene. LSD = lysosomal storage disease. MPS = mucopolysaccharidosis. MSD = multiple sulfatase deficiency. Prenatal diagnosis and pre-implantation genetic diagnosis can be useful for identifying affected embryos in at-risk pregnancies . Although it is beneficial to have identified the disease-causing mutation in the family , it is not always necessary for prenatal diagnosis. If the mother has been diagnosed as an obligate carrier through her family history, assays for the I2S enzyme and GAG levels may be conducted on cells from amniotic fluid, in chorionic villus biopsy tissue or cord blood [19, 20], allowing early testing and rapid diagnosis of affected foetuses. Females with MPS II are very rare. They are typically heterozygous for this X-linked disorder and most are asymptomatic 'carriers' with normal or slightly reduced I2S activity . Some heterozygous females have been found to develop signs and symptoms because of structural abnormalities of the × chromosome or skewed inactivation of the paternal × chromosome [7, 8, 21–25]. There has also been one report of a female patient who was homozygous for a disease-causing point mutation . The most reliable method of diagnosing MPS II in affected females and carriers is to test for a family-specific mutation that has been identified in an affected male relative [3, 16]. Sequence analysis of the entire IDS coding region may be necessary if a family-specific mutation is not known. An alternative is first to sequence the exons with the highest prevalence of mutations (e.g. exon IX) or search for recurrent mutations (e.g. p.S333L). Complex rearrangements between IDS and its pseudogene, IDS2, can also be detected by PCR. The advent of an effective treatment for MPS II has highlighted the need for a standardised method for monitoring the progression of patients with this disease and their response to therapy. There is currently no standardised severity scoring system for MPS II. Biomarkers such as urinary GAGs and heparin cofactor II-thrombin complex  have been proposed, but neither has been found to be a specific marker of disease severity in patients with MPS II [2, 27]. Standard functional tests, such as the Pediatric Evaluation of Disability Inventory (PEDI) and a test developed by the Pediatric Orthopedic Society of North America (POSNA) [28, 29], may be applicable to patients with MPS II, but this requires confirmation in a relevant population . The validation of a scoring system for such a rare disease as MPS II represents a significant challenge. In the absence of a suitable severity scoring system for MPS II, it is recommended that patients are monitored closely and undergo a comprehensive physical, biochemical, and behavioural evaluation following diagnosis and at least every 6-12 months thereafter (CO). More frequent assessment may be necessary in patients in whom signs and symptoms are progressing rapidly. Where possible, this should take place at a centre with experience of treating LSDs. Assessments should include evaluation of the musculoskeletal and cardiovascular systems, ears, airways, eyes, skin, nervous system, abdomen and gastrointestinal system, as outlined in Table 1. Many examinations are dependent on patient cooperation, so proper evaluation may be difficult in very young patients or individuals with cognitive dysfunction. It is important to note that the development of many of the individual signs and symptoms of mucopolysaccharidoses is irreversible; therefore, slowing or halting disease progression should be considered an important outcome in patients receiving treatment (CO). Close monitoring of patients with mucopolysaccharidosis type II is necessary. Characteristic features of mucopolysaccharidosis type II and the methods available to assist diagnosis [2, 3, 11, 12, 46, 47, 57, 75, 80, 81, 84, 88, 89, 97, 98, 108–129]. All assessments are subject to patient cooperation; *Essential assessment. †Optional assessment. CT = computed tomography. FVC = forced vital capacity. MRI = magnetic resonance imaging. Once a diagnosis of MPS II has been confirmed, the available treatment options should be discussed with the patient and his or her parents. An explanation of potential treatment outcomes and adverse events should be given, and realistic treatment goals should be set (CO). Enzyme replacement therapy (ERT) with recombinant I2S (idursulfase, Elaprase®; Shire Human Genetic Therapies, Inc., Cambridge, MA, USA) is commonly used to treat MPS II . Alternatives such as stem cell transplantation (STC) using umbilical cord blood, peripheral blood haematopoietic cells or bone marrow have also been used, but they appear to offer limited clinical benefits in patients with this disease and have been associated with a serious risk of morbidity and mortality [31, 32]. In many centres, STC is no longer proposed as a therapy for MPS II, although it must be stated that the literature is biased by the reporting of very poor outcomes in patients treated after the onset of significant cognitive decline (CO). Very few boys have received SCT in the early weeks or months of life (see below). Idursulfase is a purified form of I2S, produced by recombinant DNA technology in a continuous human cell line. Intravenous ERT with idursulfase provides exogenous enzyme for selective uptake into cells via mannose-6-phosphate receptors on the cell surface . Upon internalisation, the enzyme is transferred and localised within lysosomes, where it catabolises accumulated GAGs . Idursulfase is indicated for the long-term treatment of patients with MPS II. In a randomised, placebo-controlled clinical trial, intravenous administration of idursulfase (0.5 mg/kg body weight weekly for up to 53 weeks) to 32 patients was associated with significant improvements in a composite endpoint comprising change in distance walked in 6 minutes and percentage of predicted forced vital capacity (%FVC) compared with patients receiving placebo (p = 0.0049) . When evaluated individually after 53 weeks, the increase from baseline in mean (± SEM) distance walked in the 6-minute walk test was significantly greater in patients receiving idursulfase compared with those given placebo (+44.3 ± 12.3 m versus +7.3 ± 9.5 m, respectively; p = 0.0131; Figure 3a). %FVC increased more from baseline in patients treated with idursulfase than in the placebo group, although this difference did not reach significance (p = 0.0650; Figure 3b) . The mean increase in absolute FVC from baseline was significantly greater in patients treated weekly with idursulfase compared with placebo (+0.22 ± 0.05 L versus +0.06 ± 0.03 L; p = 0.0011; Figure 3c). 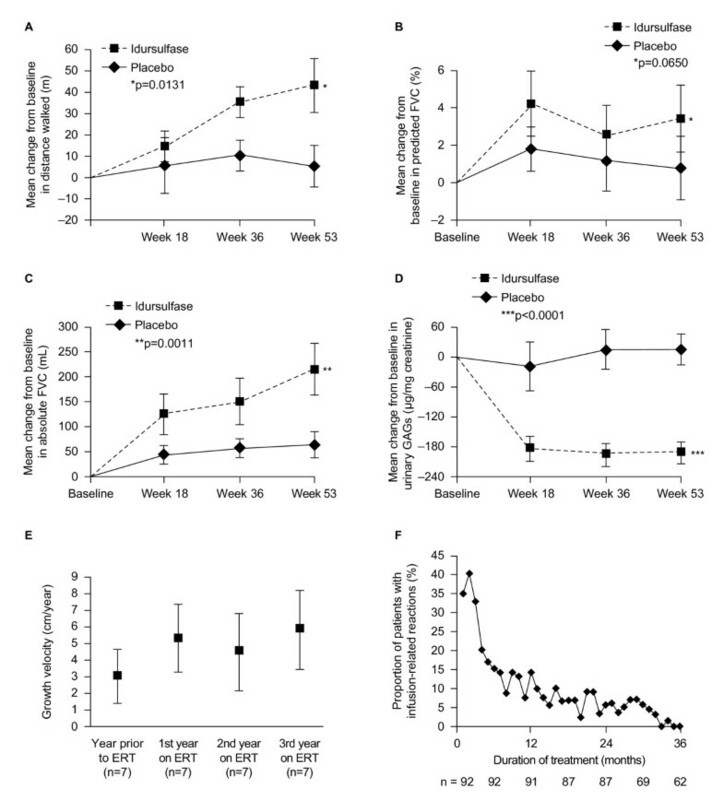 The mean decrease in liver volume at 53 weeks was significantly greater in patients treated with idursulfase compared with placebo (-25.3 ± 1.6% versus -0.8 ± 1.6%, respectively; p < 0.0001) as was the change in spleen volume (-25.1 ± 2.4% versus +7.2 ± 4.2%, respectively; p < 0.0001) . Urinary GAG levels were significantly reduced from baseline in patients receiving ERT compared with placebo (mean change, -189.2 ± 25.8 μg/mg creatinine vs. +18.2 ± 29.9 μg/mg creatinine, respectively; p < 0.0001; Figure 3d) . Aside from an improvement in elbow mobility between the weekly idursulfase group compared with placebo (p = 0.0476), no other significant differences between treatment groups for any joint range of motion were found . Clinical effects of enzyme replacement therapy (ERT) with idursulfase (0.5 mg/kg weekly) or placebo in patients with mucopolysaccharidosis type II (MPS II). (a) Mean (± SE) change from baseline in distance walked in 6-minute walk test; (b) mean (± SE) change from baseline in percentage of predicted forced vital capacity; (c) mean (± SE) change from baseline in absolute forced vital capacity; (d) mean (± SE) change from baseline in concentration of urine glycosaminoglycans; (e) mean (± SD) growth velocity before and during enzyme replacement therapy; (f) incidence of infusion reactions during treatment with idursulfase. Absolute forced vital capacity is a better measure of respiratory function than percentage of predicted forced vital capacity, as the latter assumes both normal growth and height, which does not apply to patients with MPS II. (a-d) adapted from  with permission; (e) reproduced from  with kind permission from Springer Science & Business Media; (f) reproduced from  with permission. *p = 0.0131; **p = 0.011; ***p < 0.0001, compared with placebo based on analysis of covariance. SD = standard deviation. SE = standard error. ANCOVA = analysis of covariance. FVC = forced vital capacity. ERT = enzyme replacement therapy. Following this trial, a 2-year open-label extension study of weekly idursulfase was undertaken in a population of all 94 patients that completed the Phase II/III study . Although %FVC did not change significantly except at a single timepoint, there was a sustained improvement in mean absolute FVC compared with the initial study's baseline (mean change at 3-year timepoint, +0.31 ± 0.06 L, 25.1%; p < 0.05) [34, 35]. Increases in distance walked in 6 minutes compared with baseline were maintained, although variable from one assessment to another. The largest increase was seen at 20 months after the start of the initial study - a mean increase of 42 ± 10 m from baseline (p < 0.01) . Effects on liver and spleen volume were also maintained, and a sustained reduction in urinary GAG levels was observed during 3 years of treatment, with a final mean value of 81.7 μg/mg creatinine (well below the upper limit of normal) . Joint range of abduction and flexion-extension improved for the shoulder to a degree felt to be clinically important (approximately 12° and 15°, respectively, at 36 months; both p ≤ 0.005) and remained stable in the elbow, wrist, digits, hip, knee and ankle . After 24 months, both parent- and child-assessed measures of quality of life showed significant improvements from baseline (change in parent-assessed Disability Index Score, -0.13 ± 0.06, p = 0.047; change in child-assessed Disability Index Score, -0.15 ± 0.65, p = 0.031) . Similar findings have been reported in a separate 12-month, open-label, clinical study of 10 adult Japanese patients with attenuated forms of MPS II . Idursulfase has also been found to have a positive influence on growth in 18 patients with MPS II, especially in children younger than 10 years of age (Figure 3e) . In this group a mean height increase of 14.6 cm was seen over 3 years of ERT. As with any intravenous protein product, anaphylactoid reactions, which can be life-threatening in extreme cases, have been observed in some patients treated with idursulfase [33–35, 38]. These hypersensitivity responses are more commonly known as infusion-related reactions (IRRs). Late emergent signs and symptoms of IRRs have been observed as long as 24 hours after an initial reaction , although these are often mild and do not require hospitalisation. Patients who experience moderate-to-severe IRRs should be monitored for at least 24 hours. In clinical trials, most of the adverse events reported were related to the underlying disease rather than ERT [33–36]. The most common treatment-related adverse events were IRRs (e.g. headache, hypertension, erythema, pyrexia, flushing, pruritus, urticaria, and/or rash) [33–36]. In general, rates of IRRs tended to decline over time (Figure 3f) and no patient discontinued treatment due to an IRR during clinical studies [34, 35]. Immunoglobulin (Ig) G antibodies occurred in 46.9% of patients treated with idursulfase, and IgM antibodies, of unknown importance, were reported in one patient . In approximately half of antibody-positive patients, antibody titres fell below the level of detection after continued treatment . Neutralising antibodies were detected in 22 out of 94 patients. Changes in distance walked in 6 minutes, liver and spleen volume and urinary GAG levels did not appear to be affected by neutralising antibody status . However, individuals with neutralising antibodies showed smaller increases in absolute FVC compared with patients without neutralising antibodies . Further studies into the long-term impact of neutralising antibodies on clinical response are needed. Serious adverse events were reported in a minority of patients in clinical trials [33–35]. In the randomised placebo-controlled clinical trial, two deaths occurred . Both were associated with pulmonary infections and one of the patients died following a cardiac arrest. Neither death was considered to be related to the study medication. In the subsequent 2-year extension study, one further death occurred owing to upper airway obstruction . Again, this was not considered to be related to the study drug. Hypoxic episodes during enzyme infusion, which necessitate oxygen therapy, have been reported in patients with severe underlying obstructive airway disease (sometimes with pre-existing tracheostomy). In one patient with a febrile respiratory illness, idursulfase administration was associated with hypoxia during the infusion, resulting in a short seizure . These events did not recur with subsequent administration using a slower infusion rate and premedication with low-dose corticosteroids, antihistamines and beta-agonist nebulisation. Idursulfase should be administered weekly at a dose of 0.5 mg/kg body weight by intravenous infusion over 3 hours. Although the drug's prescribing information states that the infusion period may be gradually reduced to 1 hour if no IRRs are observed, shortening the infusion time substantially is undesirable, as it may increase the risk of IRRs (CO). Infusion should be supervised by a physician or other healthcare professional experienced in the management of patients with MPS II or other inherited metabolic disorders. Delivery methods include use of a venous cannula or of a totally implantable venous access device, which is placed under general anaesthetic. The patient should be observed closely throughout the infusion and vital signs should be monitored regularly. Caution is required for patients with a febrile infection, airway abnormalities, respiratory distress, or a history of allergies. Reduction in infusion rate and premedication with antihistamines, antipyretics and/or low-dose corticosteroids may be used to reduce the risk of IRRs. Premedication should be given no more than 30 minutes before starting the infusion (CO). Following a change to the European product license for idursulfase in March 2010, infusion of ERT at home can now be considered for some patients. Although 'homecare' is not provided in all countries in Europe, it has been associated with increased patient adherence compared with receiving infusions in hospital, and patients and families often report improved quality of life [39–41]. 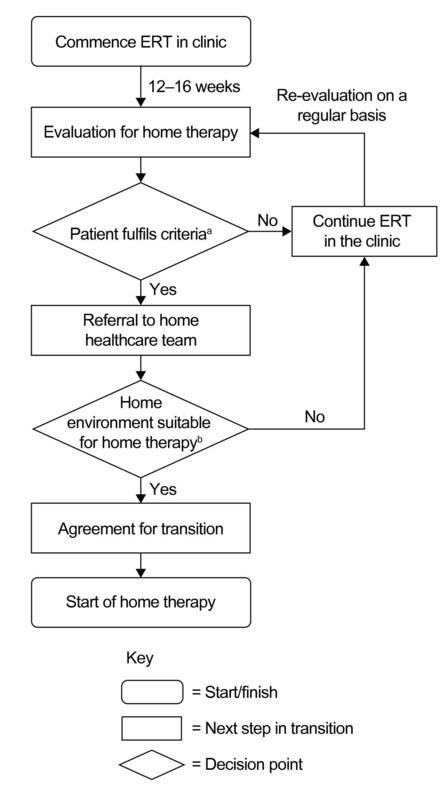 Safety is the primary consideration when providing ERT in the home setting, and strict protocols have been developed to manage the transition from hospital to home care (Figure 4) . Prior to initiation of homecare, the patient's home must be assessed to ensure that it is safe for both the child and the nurse delivering the infusion [43, 44]. Patients must have received ERT in hospital for 3-6 months; if patients have previously had IRRs, they must be under control with premedication, and they must not have had an IRR in the 2-8 weeks before homecare is approved and premedication must be given . If a patient has significant respiratory disease (%FVC, 40% or less; or evidence of serious obstructive airway disease), homecare may not be suitable . Algorithm for the provision of enzyme replacement therapy (ERT) outside of the hospital setting. a Patient aged 5 years or older, with no infusion-related reactions, with stable airway disease and established intravenous access. b Under some circumstances, an environment other than the home, such as school, may be considered as an alternative to the clinic. Adapted from  with permission from Elsevier. Many patients with MPS II will develop potentially life-threatening manifestations by the second decade of life, so timely treatment is important. The relationship between progressive GAG storage and clinical manifestations in MPS II provides a strong argument for the initiation of ERT as early as possible following diagnosis (CO). Clinical trials of idursulfase demonstrated clinical benefits of treatment in patients older than 5 years [33, 34, 36], but experience of ERT in younger children is growing . Some national guidelines recommend that ERT should be initiated for all patients with a biochemically confirmed diagnosis of MPS II, including those younger than 5 years . Idursulfase does not cross the blood-brain barrier. Thus, it will not affect the cognitive and behavioural manifestations of MPS II. Weekly intravenous therapy can place a significant burden on both the patient and their family [3, 47]; nonetheless, even for patients with advanced disease, ERT may significantly improve quality of life through improvements in respiratory function, organomegaly, and joint mobility [3, 47]. In some countries it is recommended that for patients older than 5 years who already have evidence of considerable cognitive decline, the decision to initiate treatment should be at the clinician's discretion, in discussion with the child's parents . Owing to the heterogeneous nature of MPS II and the variable rate of progression, it would seem reasonable to offer ERT to all patients for a 'trial' period of at least 12-18 months, regardless of phenotype, after which time a decision should be made, in consultation with the parents, as to whether to continue (CO). Short- and long-term effects of treatment continuation or cessation on the patient's quality of life should be the primary concern. Thus, any evidence of central nervous system (CNS) disease progression should be taken into consideration when formulating a management strategy (CO). ERT is not indicated for patients who are pregnant or lactating, or in individuals whose disease is so far advanced that there is little prospect of ERT having any benefit . There are no published data concerning any effect of idursulfase on spermatogenesis; therefore, men with MPS II should continue to receive ERT when trying to conceive (CO). Treatment is also not recommended if the patient has a comorbid life-threatening disease for which the prognosis is unlikely to be influenced by ERT . Treatment should be discontinued for patients with life-threatening IRRs that are not adequately prevented or controlled by antihistamines and corticosteroids (CO). In these circumstances, the possibility of potentially fatal sudden respiratory failure is high. Transplantation of stem cells using bone marrow, peripheral blood haematopoietic cells or umbilical cord blood has been shown to be effective in slowing disease progression in selected lysosomal and peroxisomal inherited metabolic storage diseases, including MPS IH (Hurler syndrome), MPS VI (Maroteaux-Lamy syndrome), X-linked adrenoleukodystrophy, metachromatic leukodystrophy and globoid-cell leukodystrophy (Krabbe disease) [48–54]. SCT relies on the progressive replacement throughout the body of endogenous haematopoietic lineage cells with exogenous cells transplanted from a healthy donor. Importantly, experiments in mice have shown that the transplanted cells can migrate across the blood-brain barrier, differentiate into microglia, and express lysosomal enzymes that can be taken up by cells in the CNS and delivered to the lysosome . This, coupled with the apparent inability of enzymes administered intravenously to cross the blood-brain barrier, has stimulated interest in the therapeutic potential of STC for preventing or treating the neurological manifestations of metabolic storage diseases, including MPS II. At the time of writing, no controlled clinical studies have been conducted to evaluate the effects of bone marrow transplantation (BMT), haematopoietic stem cell transplantation (HSCT) or umbilical cord blood transplantation (UCBT) in patients with MPS II; with experience limited to single published case studies or small case series. This is hardly surprising given the rarity of MPS II, and it is unlikely that formal randomised controlled trials will ever be conducted. The use of STC for the treatment of MPS II is controversial because of the profound risk of morbidity and mortality associated with this treatment approach . Many patients receive immunosuppressant and steroid medication following transplantation to protect against or alleviate graft-versus-host disease . However, the use of immunosuppressants can leave the patient vulnerable to infection, and the chronic use of steroids may lead to orthopaedic complications (e.g. osteonecrosis of the hip) . The majority of clinical experience of BMT in patients with MPS II comes from observations made in case studies. At the time of writing, only two studies have examined the long-term outcomes of BMT in groups of four or more patients with MPS II [31, 32]. In these studies, BMT was found to increase or normalise I2S activity in leukocytes, but not serum, and was associated with decreased or normalised urinary GAG excretion in patients with MPS II [31, 32]. The long-term outcomes of BMT appear unpredictable in patients with MPS II, perhaps owing to the heterogeneity of the disease. Resolution of hepatosplenomegaly, improvement of upper airway obstruction, progressive resolution of coarsened facial features, reduced joint stiffness, stabilisation of perceptual hearing defects and improvement in transmission hearing defects were all reported . Cardiac structure and function were found to stabilise in some patients ; an important finding given that cardiac failure is a common cause of death in individuals with MPS II . However, no quantitative data are available for any of these observations. BMT does not appear to improve neurological function in patients with a severe phenotype if they already have signs of developmental delay or neurological involvement at transplantation [31, 32]. By contrast, stabilisation of neurological function following BMT has been reported in patients with MPS II with an attenuated phenotype who were followed for 7-17 years . Whether this observation can be attributed to BMT is unclear. Observations from individual case studies include stabilisation of disease, resolution of hepatosplenomegaly and skin tightness, and improved joint mobility and growth, each contributing to increased quality of life [58–61]. Clearance of GAGs from hepatocytes has also been described . Reports on the effect of BMT on the progression of neurological manifestations are inconsistent, with no deterioration in some patients , but clear deterioration in others despite transplantation at a young age . As with BMT, there are very few data on the effects on HSCT in patients with MPS II. Notable observations include a reduction in levels of a urinary marker of GAG levels (measured as dermatan sulphate to chondroitin sulphate ratio) in one patient , and complete resolution of skin papules and a progressive reduction in skin tightness in five boys (aged 4-11 years) within 35 days of HSCT . Improvement or complete resolution of hepatomegaly has been reported in patients with mild and severe forms for MPS II following UCBT [56, 66]. Urinary GAG excretion was normalised in a patient with an attenuated form of MPS II, and growth and development remained normal up to 2 years after transplantation . No other physiological changes following UCBT have been reported. Detection of very low I2S levels in the brain of a patient with a severe form of MPS II suggests that stem cells delivered by UCBT may be able to penetrate the CNS in individuals with MPS II, although enzyme levels were insufficient for metabolic improvement . Overall, it appears that SCT can have some beneficial effects on the peripheral signs and symptoms of MPS II. However, it is clear that this approach does not preserve or improve neurological function in patients with severe forms of MPS II if they already show signs of neurological deterioration. The long-term effects of BMT, HSCT and UCBT on neurological function in patients with more attenuated forms of MPS II require further study. In the absence of a clear long-term effect on the neurological manifestations of MPS II, the potential clinical benefits of successful engraftment do not appear to outweigh the immediate and medium-long-term risks of the procedure, particularly when other effective and well-tolerated treatments for peripheral manifestations are available (CO). Owing to the dearth of therapeutic options for alleviating the neurological manifestations of LSDs, much research has focused on the development of well-tolerated therapies that can cross the blood-brain barrier. One approach that has been explored is the infusion of ERT into the cerebrospinal fluid, thereby enabling widespread distribution throughout the CNS. Experiments in animal models have yielded promising results , and a study into the feasibility and safety of intrathecally delivered idursulfase in patients with MPS II is underway. Other areas of research include the use of pharmacological chaperones, gene therapy and substrate reduction therapy. Although a comprehensive overview of these therapeutic options is beyond the scope of this article, all have been found to cross the blood-brain barrier and promising findings have been reported in vitro and in animal models [68–72]. It is hoped that in the near future these therapies may help to prevent or reverse the neurological manifestations observed in patients with severe forms of MPS II. The wide range of effects of MPS II on the body and the severity of many of the manifestations mean that most patients will require substantial medical and surgical support, even if they are receiving ERT or have received SCT. A full review of this broad topic is not possible here, so key aspects of multidisciplinary care are presented. Cardiovascular manifestations develop at a young age in patients with MPS II, and most patients exhibit at least one cardiovascular sign or symptom by the second decade of life . Typical changes include valve disease (e.g. changes in morphology and impaired function: affecting mitral, aortic, tricuspid and pulmonary valves in decreasing frequency), ventricular hypertrophy, hypertension, and arrhythmia (e.g. tachycardia, bradycardia, atrioventricular block) [3, 14, 73]. The progression of cardiac involvement must be monitored closely, and patients should undergo regular echocardiography, electrocardiography, and Holter monitoring, if indicated (Table 1). Valve disease affects more than half of patients and can lead to ventricular hypertrophy or heart failure [3, 12]. In some countries, prophylactic antibiotic therapy may be given before any surgical or major dental procedure as a precaution. However, this practice is no longer recommended by the National Institute for Health and Clinical Excellence . Valve replacement has been reported, but remains uncommon [75, 76]. Hypertension is typically under-diagnosed in patients with MPS II and should be treated using standard agents, such as angiotensin-converting enzyme inhibitors, angiotensin receptor blockers, diuretics and calcium-channel blockers (CO). Arrhythmias should be treated with ablation, antiarrhythmic drugs, anticoagulants and, if necessary, placement of an implantable cardioverter defibrillator (CO). Depending on disease severity, neurological manifestations of MPS II may include a delay in achieving developmental milestones, cognitive impairment and seizures [11, 12]. In addition, communicating hydrocephalus, spinal cord compression, and carpal tunnel syndrome (CTS) typically require surgical intervention . Impaired cognition or delayed speech in children of preschool age should provoke further investigation with cognitive tests, and behavioural therapy and/or the use of behaviour-modifying medication may be necessary (CO). Seizures can usually be controlled by anticonvulsant therapy . To avoid unwanted adverse events, low-dose monotherapy is preferred (CO). For patients with communicating hydrocephalus or evidence of progressive ventricular enlargement, a ventriculoperitoneal shunt can be placed to relieve intracranial pressure [77, 78]. Motor function has been reported to improve after shunt placement . A common feature of MPS II is progressive compression of the spinal cord with resulting cervical myelopathy [47, 80]. This can lead to reduced activity, difficulty in rising from a sitting position, paresis and spasticity, pain or loss of sensation in the upper and lower body, as well as bladder and bowel dysfunction. Irreversible cord damage can occur if this is left untreated, so surgical decompression should be considered as soon as symptoms occur [81–83]. Similarly, decompression of the median nerve is recommended for patients with demonstrated loss of hand sensation and/or function or abnormal nerve conduction studies (CTS). Both decompression procedures have been associated with rapid and sustained improvement in sensation and function, as well as providing pain relief [47, 84–87]. Ocular involvement in MPS II generally consists of loss of vision, optic disc swelling, papilloedema, optic atrophy and retinal pigmentary degeneration [2, 88]. Corneal clouding is almost never encountered . Treatment of ocular complications in patients with MPS II does not differ substantially from approaches used for otherwise healthy individuals (see Table 1). If glaucoma occurs, most patients respond well to intraocular pressure-lowering eye drops (CO). If optic nerve involvement occurs due to raised intracranial pressure, this should be addressed using standard methods. Unfortunately, optic involvement associated with GAG accumulation or retinal degradation cannot be treated, although patients do benefit from magnifying devices when reading (CO). Typical musculoskeletal manifestations of MPS II include short stature, spine deformities, joint stiffness, contractures, and claw-like hands . Orthopaedic therapy should be considered for patients with musculoskeletal manifestations, as this can help to address psychosocial aspects of the disease, such as loss of mobility and independence, as well as relieving the symptoms themselves. Non-surgical approaches include physiotherapy and the use of orthopaedic devices, such as orthotic footwear, braces, corsets and walking aids, to assist with daily living activities. These approaches can also help maximise muscle strength and range of movement . Surgical procedures include decompression of the spinal cord or median nerve, instrumented fusion (to stabilise and strengthen the spine), arthroscopy, hip or knee replacement, and correction of the lower limb axis [89, 90]. It has been suggested that recombinant human growth hormone (GH) may help overcome short stature in patients with MPS II . GH therapy has been shown to be well tolerated and effective in improving linear growth in patients with GH deficiency, Turner syndrome and other growth disorders [92–94]; however, experience in patients with MPS II is very limited. The only published report of GH therapy in patients with MPS II is provided by Polgreen & Miller, who observed transient increases in growth velocity in two patients treated for up to 1 year . Although GH therapy was well tolerated in these patients, there are currently insufficient data on the safety and efficacy of this approach in children with MPS II to recommend it as a standard of care (CO). Furthermore, rapid growth carries the theoretical risk of worsening of orthopaedic complications typically observed in patients with MPS II . With this in mind, patients with MPS II who are prescribed GH therapy must be followed closely by orthopaedic physicians who are familiar with MPS diseases . Ear, nose and throat features of MPS II include hearing loss, recurrent otitis media, an enlarged tongue, hypertrophic adenoids and tonsils and progressive airway obstruction [97, 98]. Chronic and recurrent (more than six episodes per year) upper-respiratory tract infections are common, and affected patients may benefit from analysis of functional antibodies to Streptococcus pneumoniae and Haemophilus influenzae, with booster vaccinations being provided when appropriate (CO). In the absence of a correctable immune deficiency, adenotonsillectomy or ventilation tube insertion may be appropriate for patients with severe signs and symptoms (CO). If hearing loss occurs secondary to persistent middle ear effusion, the possibility of providing hearing aids or inserting ventilation tubes should be discussed with the patient and their parents. Both treatments are effective, but hearing aids are preferred for children with significant comorbidity (CO). Macroglossia secondary to GAG storage is very difficult to manage. Operations on the tongue are not indicated in patients with MPS II, as the risk of postoperative respiratory obstructions is high (CO). Upper airway obstruction is a major contributor to the premature mortality seen in MPS II . It is thought to result from progressive deposition of GAGs in the soft tissues of the throat and trachea, and may lead to obstructive sleep apnoea . Initial treatments for obstructive sleep apnoea include nocturnal supplemental oxygen. Tonsillectomy and adenoidectomy may be performed when these are enlarged [90, 97], but, because of the progressive involvement of the throat and trachea, improvements may only be partial and/or temporary. Continuous positive airway pressure (CPAP) can be used to splint the airway open during sleep, and has been associated with marked improvements in sleep quality [98, 99], leading to reduced fatigue during the following day and fewer complaints of headache . For patients for whom CPAP is not well tolerated, tracheostomy may be used to bypass the upper airway obstruction or to support the trachea when there is significant collapse due to tracheobronchomalacia. However, complications following this procedure are common and can be life-threatening , so caution is advised (CO). Patients with MPS II should undergo regular examination of the upper airway for signs and symptoms of developing airway obstruction, and an overnight sleep study should be conducted in patients with obstructive sleep apnoea (Table 1) [47, 98]. For a more thorough evaluation of the airway, bronchoscopy may be performed . Routine monitoring of pulmonary function is challenging, as spirometry requires the full cooperation of the patient and is effort dependent. It cannot be used reliably for children younger than 6-7 years of age and may be impossible for patients with significant CNS involvement . Surgical intervention is often required at a young age to address the clinical manifestations of MPS II [75, 76, 90]. The most common procedures are insertion of ventilation tubes, hernia repair, adenoidectomy, tonsillectomy, and median nerve decompression . Surgery may sometimes precede diagnosis, so it is important to evaluate a patient's surgical history when a diagnosis of MPS II is suspected . The short neck, immobile jaw, and pathological changes in the upper airways make general anaesthesia for patients with MPS II a difficult and high-risk procedure . For this reason, it is good practice to consider local or regional anaesthesia where possible. Combining minor surgical procedures may be appropriate in some instances; however, extending the operation time increases the risks of respiratory complications dramatically, so caution is advised (CO). Before surgery, the patient should be assessed by a multidisciplinary team that includes a cardiologist, otorhinolaryngologist and anaesthetist. A full cardiac assessment is necessary (CO). The severity of obstructive sleep apnoea can be assessed with a sleep study or more formal polysomnography. If possible, flexible nasendoscopy and a computed tomography scan of the airway should be carried out preoperatively to evaluate the anatomy of the airway [101, 102]. Tracheomalacia of the airway makes visualisation and subsequent endotracheal intubation problematic (Figure 1e) [103, 104]. Extubation presents another major risk, as postobstruction pulmonary oedema may exacerbate upper-airway obstruction and has been reported to occur as late as 27 hours after surgery [97, 105, 106]. Some patients may be unable to maintain the airway after extubation, resulting in the need for urgent reintubation or tracheostomy. Early extubation can reduce this risk substantially . As a rule, it is recommended that patients with MPS II should only undergo surgery at centres with experience of the perioperative management of individuals with this disease, and on-site intensive care facilities [98, 106]. Patients with MPS II and their families generally require considerable psychological and social support following diagnosis and before and after treatment. Clinicians should be prepared to provide guidance on treatment-related issues and to answer questions concerning carrier status and prenatal diagnosis. Genetic counselling should also be offered to family members. Patient societies provide vital psychosocial support to parents and siblings through one-to-one counselling, as well as providing links to other affected individuals through befriending schemes and regional family days. They play a key role in helping patients and their families to understand their disease, and can make parents aware of disability benefits, respite care, and housing help for which they may be eligible. Both verbal and written information is provided regarding issues such as education, grants, equipment, care plans, independent living, and pre- and post-bereavement support. In recent years, patient societies have worked closely with physicians, specialist nurses and homecare companies to make new treatment options available to patients. For instance, in the UK, the Society for Mucopolysaccharide Diseases  played an important role in enrolling patients into idursulfase clinical trials, and continues to assist patients who want to take part in ongoing investigations by ensuring that patients and their families are adequately supported. Importantly, patient societies also can help gather valuable information on how treatment affects quality of life by encouraging their members to participate in surveys. MPS II is a rare, inherited disease that affects multiple organs and systems. The development of ERT with idursulfase has provided a means of addressing the underlying lysosomal enzyme deficiency, and improvements in certain somatic signs and symptoms have been reported in clinical studies. Unfortunately, options for alleviating the neurological manifestations of MPS II remain limited: intravenously administered idursulfase does not pass through the blood-brain barrier, and experience of intrathecal administration of ERT is restricted to small clinical trials. There are few published data on long-term outcomes from STC in MPS II, especially regarding neurological function. Further work is required to ascertain whether the potential benefits of successful engraftment outweigh the risks of the procedures, particularly as an effective treatment of certain peripheral manifestations is already available. Given the heterogeneous presentation of this disorder, a wide range of specialties is likely to be involved in its diagnosis and most patients require substantial medical, surgical, and psychosocial support. Thus, close collaboration between all involved in dealing with MPS II is essential if patients are to be diagnosed as early as possible and treated safely and effectively. JEW accepts full responsibility for the manuscript and controlled the decision to publish. The HSEEC receives financial support from Shire Human Genetic Therapies. Scientific editorial assistance was provided by Dr Jonathan Morton (Oxford PharmaGenesis™ Ltd, UK), Dr Terence Eagleton (previously Medical Director, Europe, the Middle East and Africa; Shire Human Genetic Therapies) and Dr Paul Marcus, an independent pharmaceutical physician, and was funded by Shire Human Genetic Therapies. Consent has been obtained from the patient's mother for publication of the associated image in Figure 1. MS has received honoraria and travel expenses for presenting at scientific meetings and sitting on advisory boards sponsored by BioMarin Pharmaceutical, Inc., Genzyme Corporation and Shire Human Genetic Therapies, and is a member of the HSEEC, which receives financial support from Shire Human Genetic Therapies. MS also receives honoraria for development of educational presentations for Genzyme Corporation and Shire Human Genetic Therapies. MS's institution receives research grants from Genzyme Corporation and Shire Human Genetic Therapies. ZA has received reimbursement for presenting lectures at symposia arranged by Shire Human Genetic Therapies and partial funding for travel to these symposia. ZA is a member of the HSEEC, which receives financial support from Shire Human Genetic Therapies. MB has received honoraria, travel support and unrestricted grants from Shire Human Genetic Therapies, Genzyme Corporation, BioMarin Pharmaceutical, Inc. and Actelion Pharmaceuticals Ltd. MB is a member of the HSEEC, which receives financial support from Shire Human Genetic Therapies. OB is a member of a Speakers' Bureau for Shire, Inc. OB is a member of the HSEEC, which receives financial support from Shire Human Genetic Therapies. IAB has received travel grants and honoraria from Shire Human Genetic Therapies to attend and deliver lectures at medical meetings. LDM has received honoraria and travel expenses for presenting at scientific meetings and sitting on advisory boards sponsored by Genzyme Corporation and Shire Human Genetic Therapies. LDM is a member of the HSEEC, which receives financial support from Shire Human Genetic Therapies. NG's institution has received funding from Shire Human Genetic Therapies for involvement in a patient registry, clinical trials and for travel and accommodation during a LSD symposium. NG is a member of the HSEEC, which receives financial support from Shire Human Genetic Therapies. EG-N has received travel grants from Shire Human Genetic Therapies. EG-N is a member of the HSEEC, which receives financial support from Shire Human Genetic Therapies. PH has no competing interests. SJ has received travel assistance and honoraria for lectures, and consultancy fees from Shire Human Genetic Therapies. SJ is a member of the HSEEC, which receives financial support from Shire Human Genetic Therapies. WK has received honoraria for giving lectures at symposia arranged by Shire Human Genetic Therapies and partial funding for travel to the symposia. CK has received research funding, consultancy fees and/or speaker's fees from Shire Human Genetic Therapies, Genzyme Corporation, Actelion Pharmaceuticals Ltd and BioMarin Pharmaceutical, Inc.
CL has received speaker's honoraria from Shire Human Genetic Therapies, BioMarin Pharmaceutical, Inc. and Genzyme Corporation and partial funding for medical advice. CAL has received reimbursement of expenses and honoraria from Shire Human Genetic Therapies and Genzyme Corporation. The Society for Mucopolysaccharide Diseases (UK) has received educational grants from Genzyme Corporation, Shire Human Genetic Therapies, BioMarin Pharmaceutical, Inc. and Amicus Therapeutics, Inc. The Society for Mucopolysaccharide Diseases also receives fees and reimbursement of expenses in respect of clinical trial patient access from BioMarin Pharmaceutical, Inc. and Shire Human Genetic Therapies. ELT has received funding for travel and expenses for attendance at scientific meetings sponsored by Shire Human Genetic Therapies and is a member of the HSEEC, which receives financial support from Shire Human Genetic Therapies. BL has received honoraria and travel expenses for attending and presenting at scientific meetings and sitting advisory boards sponsored by Shire Human Genetic Therapies, Genzyme Corporation and BioMarin Pharmaceutical, Inc. BL has also received honoraria for providing writing, medical and/or administrative support to Shire Human Genetic Therapies, Genzyme Corporation and BioMarin Pharmaceutical, Inc. BL is a member of the publication steering committee for LSDs, which is sponsored by Shire Human Genetic Therapies. BL also receives honoraria for development of educational presentations for Genzyme Corporation. BL's institution receives research grants from Shire Human Genetic Therapies and BioMarin Pharmaceutical, Inc.
AML has served on scientific advisory boards and as a consultant for Shire Human Genetic Therapies, Zymenex A/S, and Genzyme Corporation. AML has received funding for travel from Genzyme Corporation and Shire Human Genetic Therapies, and receives research support from Shire Human Genetic Therapies and Genzyme Corporation. AML is a member of the HSEEC, which receives financial support from Shire Human Genetic Therapies. GM has received reimbursements for giving lectures at symposia arranged by Shire Human Genetic Therapies and partial funding for travel to the symposia. GM is a member of the HSEEC, which receives financial support from Shire Human Genetic Therapies. SP has received travel grants, speakers' honoraria and scientific grants from Shire Human Genetic Therapies, as well as travel grants from BioMarin Pharmaceutical, Inc. and Genzyme Corporation. MR has no competing interests. CS has received funding from Shire Human Genetic Therapies for travel to LSD symposia. AT-S has received speaker's honoraria and is a principal investigator in clinical trials conducted by Shire Human Genetic Therapies. AT-S is a member of the HSEEC, which receives financial support from Shire Human Genetic Therapies. AvdP is a member of the HSEEC and the Hunter Outcome Survey Board, which receive financial support from Shire Human Genetic Therapies. RW has no competing interests. JZ is a member of the HSEEC, which receives financial support from Shire Human Genetic Therapies. JEW is member of the HSEEC and Global advisory board, which receive financial support from Shire Human Genetic Therapies. JEW has received honoraria and travel expenses for presenting at scientific meetings sponsored by Shire Human Genetic Therapies. JEW drafted the manuscript, and other authors contributed to the writing. All authors have seen and approved the final manuscript. The Society for Mucopolysaccharide Diseases. [http://www.mpssociety.co.uk].